HONG KONG, May 10, 2016 - (ACN Newswire) - YPO, the premier network of global business leaders and chief executives, today announced that economic sentiment for Asia remained steady at an optimistic 60.0 in the first quarter of this year, despite significant fluctuations in confidence within the region. The YPO Global Pulse reported that business leaders in the region are now the second most confident in the world, trailing their counterparts in the European Union. The marginal rise in confidence amongst business leaders in the region comes after better-than-anticipated GDP growth in China, allaying fears of a dramatic economic slowdown in the country. Sentiment in China, the region's largest economy, improved by 2.0 points in the first quarter of 2016 to 64.0, representing a higher than the average confidence level for the country. However, there were marked differences in trajectory between countries within the region. India and Singapore reported significant increases in confidence, whilst Japan, Hong Kong and Philippines all experienced a decline in sentiment. India, in particular, witnessed a rebound in confidence level, surging 5.6 points from 60.8 in the last quarter of 2015 to 66.4 in the first quarter of this year. Economic growth in India is being fueled by a vibrant service sector, as India has become a major exporter of business outsourcing services. "The general feeling seems to be that there are strong opportunities for growth and expansion, but CEOs will be cautious about taking on too much risk in the current economic environment," said Paul Tao, managing director of New Heritage Investments Limited and network officer in YPO Hong Kong Chapter. "Increased confidence seems to be returning in the major economies of China and India, which would bode well for the entire Asian region going forward." Globally, in the first quarter of 2016, the YPO Global Pulse Index composite score remained steady at 58.3, reflecting a stable economic outlook. Confidence in Africa increased 2.2 points to a relatively positive 53.2 while confidence in the United States edged up 0.5 point to 59.6. Confidence in the European Union climbed 1.1 points to 61.6 while in Latin America confidence significantly declined by 3.6 points to 50.8. Sales, employment and fixed investment outlooks unchanged in first quarter. There was little movement from the previous quarter across the three major indexes in the survey, tracking sales, employment and fixed investment. The YPO Sales Confidence Index for Asia remained flat, up 0.3 point in the first quarter 2016 to 66.7, with 59% of CEOs expecting an increase in sales over the next year. The Employment Index for Asia slipped 0.3 point to 56.7, with 30% of CEOs forecasting an increase in headcount in the next 12 months. Only 7% expected the size of their workforce to shrink in that period, suggesting that employment levels may improve across the region. The Investment Index for Asia rose 0.5 point to 61.4, as 45% of business leaders expected to increase fixed investment in the next year. ASEAN CEOs less optimistic as emerging economies struggle. Confidence within the ASEAN countries fell away in the first quarter of 2016, as emerging economies in the region continued to feel the full effects of the Chinese economic slowdown. The YPO Global Pulse Index for ASEAN countries - Indonesia, Malaysia, Philippines, Singapore, Thailand, Brunei, Myanmar (Burma), Cambodia, Laos, Vietnam - fell 3.3 points to 56.9 in the first quarter 2016. Having rebounded in the fourth quarter 2015, after reaching a record low in the third quarter, confidence has eroded again to the extent that the ASEAN countries once again trail the wider regional score for Asia by more than 3 points. Contrasting stories for China and Japan. Whilst confidence rebounded in China in the first quarter of 2016, boosted by GDP growth of 6.7%, it was a different story in Japan, where the rising value of the yen against the dollar has had a negative impact on Japanese trade and exports. 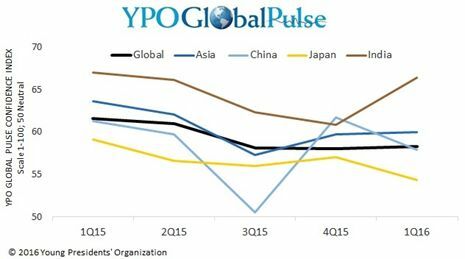 The YPO Global Pulse Index for Japan slipped 2.7 points to 54.3, its lowest level since the third quarter of 2012. Confidence returned amongst YPO CEOs in India in the first three months of 2016. The World Bank stated that India was the fastest growing economy in the world last year, with 7.3% GDP growth, and the rate of expansion is forecast to increase to 7.5% this year. The YPO Global Pulse Index for India rose 5.6 points to land at 66.4, putting it far ahead of the Asia composite score of 60.0 and ahead of all of the other leading economies in the world. Most increase in confidence in Australasia. The YPO Global Pulse Index for Australasia modestly increased 1.1 point in the first quarter of 2016, coming in at 59.3. More than a quarter (26%) of CEOs reported that economic conditions in the region had deteriorated over the previous six months, compared to 22% who believed that conditions had improved and 52% who felt conditions had remained the same. The picture is unlikely to change a great deal in the short term with 53% of members forecasting little or no change in economic conditions in the next six months. However, CEOs in Australasia remained confident about the prospects of their own organisations over the next year, with each of the indices tracking sales, employment and fixed investment, increasing slightly. Almost two-thirds (61%) of CEOs expected to grow revenues, 35% expected to increase headcount, and 32% forecasted a rise in fixed investment in the next 12 months. The quarterly electronic survey, conducted in the first two weeks of April 2016, gathered answers from 2,209 YPO chief executive officers across the globe, including 241 in Asia and 97 in Australasia. Visit www.ypo.org/globalpulse for more information about the survey methodology and results from around the world.